There are lot of things that join Kolkatans or Calcuttans but the one common thing is food and when it comes to food, street food is pretty much there on the top of the chart. And in that every kolkatan has a fixation for rolls.. They simply yearn for it and it is same across all age groups, grandmas to baby Tina every body wants roll… Not just that any self respecting Bengali would have to have roll at least once a week, well the only other street snack is Puchka (gol gappa, pani puri).. And if by chance these kolkatans hail from the south of the city, then for them it is a supreme and perhaps the only form of snack they would gorge on. The little known facts about our very loving roll, it was invented in Nizams in Kolkata a few decades back, it all started with Mutton roll, then moved to chicken and egg roll.. And if you just go to a roll shop and say I want roll, you would be served with egg roll..
With the passage of time, many varients of roll have come up.. Chicken tikka roll, Malai tikka roll, hariyali kabab roll, achari kabab roll, similar varieties for mutton roll as well and even a combination of eggs with them.. The varieties are countless, you could replace them with sheek kababs.. The humble roll has gone a long way, a snack invented in a tiny eatery in Kolkata has found its way in five star hotels and across numerous cities.. Personally, roll holds a very special place in my heart.. It is a snack I grew up eating, seeing mum making it over weekends and even when we visted our friends and families roll seemed to dominate the coffee table. Oil- half cup and more for basting. Mix all the ingredients except the onion and the green chilies with the chicken and leave it in the fridge to marinade for about 6-7 hours, overnight is even better. Preheat the oven to 170 degrees and put it to cook on an oven tray for about an hour, last 15 mins bring the heat down to 150 degrees C. Once cooked keep it aside. Take the finely chopped onions and fry them gently in oil, till they soften. Add the green chillies and then the chicken pieces.. Mix them well and keep them aside. combine flour and oil and water little by little and then knead it into a soft dough. Leave it for about a couple of hours. Then form medium disk like balls from the dough. Roll them out on a flat surface and place them on ideally a tawa (flat frying pan with no raised sides) if then then the usual frying pan. add oil from the sides and fry it till there are soft brown spots and the paratha beings to sizzle.. do not over cook they tend to stretch..
Place the paratha on a flat surface. take 5-6 pieces of the chicken tikka and place them in the center, if you wish you can add sone fresh onion rings. Squeeze the lemon on top and roll it up..
To keep it warm just cut out medium squares of the foil and reap the lower half of the roll with it. Ideally baking paper or parchment paper is good but foil would do. 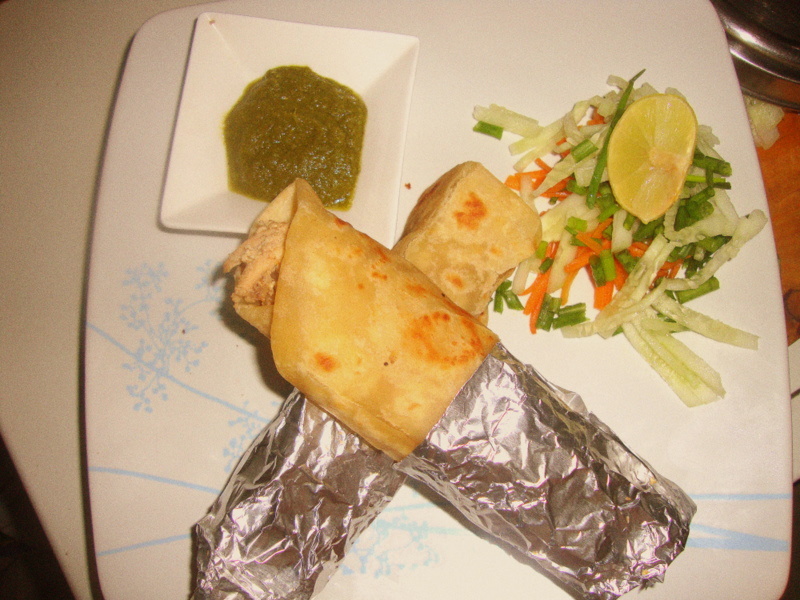 Serve the roll with thinly sliced carrots and onions and cumber salad..